According to a study conducted by the Center For Leadership Development And Research at Stanford Graduate School of Business, Stanford University’s Rock Center for Corporate Governance and The Miles Group, many CEOs struggle with isolation and a sense of loneliness. Almost two thirds of CEOs don’t receive any outside leadership advice. 100% of the respondents said they’d be open to making changes based on feedback. By coming together CEOs help each other realize their individual goals. Instead of learning through reading case studies, they work in real-time on actual business issues. It provides a broader range of perspectives and business issues. Far more than a CEO would be exposed to from people at their own company. But there’s something else…another benefit. CEOs in such groups begin to view their companies vertically and horizontally. They pay closer attention to the power of peers within their own organizations. The power of peers is partly found in not getting answers, but in being questioned. That benefit is sparked because of a few fundamental elements found in an effective peer advisory group. One, impartiality. Fellow CEOs aren’t bothered with the considerations of employees, board members, suppliers or customers. They have no agenda other than helping one another grow their business. Two, shared challenges. CEOs in these groups serve completely different customers perhaps, but they share common challenges about employees, growth, profitability, executive development, technology, and a host of other things. Their diversity results in enhanced learning. The more they talk, the more they realize they have a lot in common. Three, learning. Shared ideas across different industries, at different stages of growth…makes for rich conversations where deep learning happens. Sharing wins and losses builds trust, further deepening the conversation and learning. Four, empathy. It takes one to know one. People who have never been a CEO can’t relate, but fellow CEOs can. The empathy of people walking in the same shoes is vital to creating an environment where shared experiences enrich everybody’s life. Five, owning the solution. Peer advisory groups aren’t consulting firms. Instead of offering solutions they help members arrive at their own. And each member decides for themselves what actions they’ll take. In 1991 Etienne Wenger-Traynor and Jean Lave coined the term communities of practice. It’s been described as “groups of people who share a concern, a set of problems, or a passion about a topic, and who deepen their knowledge and expertise in this area by interacting on an ongoing basis.” That’s exactly what happens inside a peer advisory group of CEOs or business owners. In ancient Greece craftsmen formed communities where members trained one another and shared innovations. During the Middle Ages guilds offered a similar experience for artisans. Ben Franklin, in early American history, organized a group of 12 friends to provide an ongoing forum for structured discussion. That original group was diverse. There were printers, surveyors, a cabinet maker, a cobbler, a clerk and a merchant. They met on Friday evenings to talk politics, morals and philosophy. “Our debates were to be under the direction of a president, and to be conducted in the sincere spirit of inquiry after truth, without fondness for dispute or desire of victory,” said Franklin. In 1793 the group originally known as the Junto became the American Philosophical Society, created “to promote useful knowledge in the colonies.” It still operates today! Most people first heard of this idea in Napoleon Hill’s book, Think and Grow Rich. He described the advent of the mastermind group and how Andrew Carnegie and Henry Ford credited their mastermind groups for much of their success. Hill regarded these groups as the secret to success of all great men at the time. As of 2015 Millennials represented 45% of the workforce. 28% of them serve in management roles. It’s a generation that relishes connection with colleagues. Digital and face-to-face connections are highly sought and valued. The communities of practice found in a business peer advisory group – such as The Peer Advantage – gives business owners the ability to work on their current issues and challenges in real time. No case studies. No fictional scenarios. Real-time learning that happens from their own individual and collective experiences. 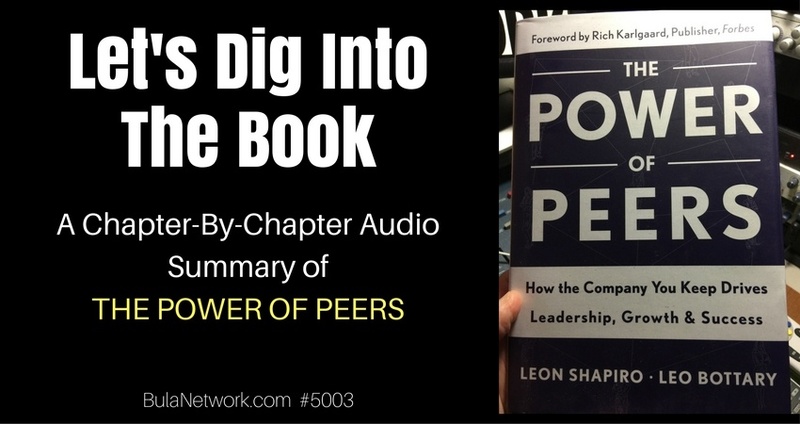 Peer influence isn’t the same as peer advantage. We connect online or in person. Mostly we connect with acquaintances, even if they’re people we’ve never met before. We network online or at conferences and seminars. Maybe at local events. It’s likely more selective and with a purpose of advancing personal and professional interests. There’s a difference between peer influence and peer advantage. In the first one we experience when we connect and network. In the later, we optimize and accelerate, two terms that are the focus of the book. We optimize when we work together in teams to perform at high levels of excellence. Think Blue Angels or Special Forces. Accelerate is the ultimate means for gaining peer advantage. The objective is to grow, meet tough challenges, achieve lofty goals and grow as leaders. Peer advantage is peer influence of the higher order. Peer advisory groups employ 5 factors essential to the group experience and to achieving desired outcomes. Create a safe environment – cultivate an atmosphere that is judgment-free, inspiring open dialogue and deep learning. Utilize a smart guide – someone who can effectively facilitate the conversation. Foster valuable interaction – establish a process that encourages rich and meaningful conversations. Be accountable – honor a shared expectation that you will do what you say you’ll do. No CEO or business owner should have to go it alone. So ends chapter 1. That way you’ll be able to follow along with greater detail. I hope to give you an overall sense of the book’s content, but would encourage further reading and study. Peer groups are quite natural. We’ve experienced them whenever we’ve been part of a team or organization that works together toward a common purpose. As business owners and leaders most of us have NOT experienced them. Instead, we’re surrounded by our employees, including our executive team. And these are good, maybe even great people. After all, we had a hand in bringing them into our organization either directly or indirectly. We’ve also got vendors and suppliers. Some of them are close to us. We even socialize with a few of them because we like them. And we’ve got professional people helping us at every turn. Our CPA or accountant, our attorney and other professionals who help us navigate a variety of specific challenges. All good people. Some great. But they all need something or require something from us. It’s fine. It’s just how it is. Through the years I’ve sat down with countless CEOs and business owners to discuss their challenges. In every instance, they’ve admitted there are many things in their lives that they feel must be endured alone. From the CEO who is having secret meetings to have preliminary discussions about an acquisition who confesses he can’t even take that to his CFO to the business owner whose wife has just been diagnosed with a serious ailment. Professional issues. Personal issues. Every human being yearns for connection. It doesn’t matter how tough you are, or how smart you may be, or how resilient you’ve been (and still are). You need other people. There’s no such thing as the “self-made” man or woman. We’ve all had help. We all need help. SMB owners are accustomed to going their own way. Maybe you’ve prided yourself in being unemployable because you just can’t work for anybody else. Maybe you’ve just been driven to do your own thing. Whatever your drives and motivators…you’re at the helm of your own business. It all rests on you and you wouldn’t have it any other way. That doesn’t make you immune from loneliness and the desire to have input from others. There’s a trite proverb, but many would argue that doesn’t make it any less true. I argue that it’s completely false. Instead, I know that business owners can go fast and far together. Growth is accelerated when we have the help and support of others. We can reach higher faster when we go together. That’s what The Peer Advantage is all about. For more details just visit THE PEER ADVANTAGE. P.S. Check out Leo’s podcast – YEAR OF THE PEER.